It was a grace note for the ages. "Dear Bill," George H.W. Bush scribbled Jan. 20, 1993, to the Democrat about to succeed him as president. "When I walked into this office just now I felt the same sense of wonder and respect that I felt four years ago. I know you will feel that, too." Short yet intimate, the note left in the Oval Office from vanquished to victor seeded a friendship that flowered in the decades since, to a point where Bill Clinton said upon Bush's death Friday : "I just loved him." Hillary Clinton says the letter made her cry, when she first read it back then and again when she heard Bush was gone. "That's the America we love," she said on Instagram. "That is what we cherish and expect." It is traditional for an outgoing president to leave a letter for his successor. Barack Obama's to Donald Trump offered congratulations on "a remarkable run" and checked off verities of American leadership -- advice to "build more ladders of success," "sustain the international order," yet take time for family. It was as guarded as when they awkwardly posed for photos together and shook hands. Bush, who months before writing his letter had warned voters to "watch your wallet" with that Democrat Clinton, was self-effacing and personal in his handoff. "I wish you great happiness here," he wrote. "I never felt the loneliness some Presidents have described. There will be very tough times, made even more difficult by criticism you may not think is fair. I'm not a very good one to give advice; but just don't let the critics discourage you or push you off course. "You will be our President when you read this note," he continued (underlining "our"). "I wish you well. I wish your family well. "Your success now is our country's success. I am rooting hard for you. Writing in The Washington Post on Saturday, Bill Clinton said those words showed a man with "natural humanity." Clinton said the two men had a respectful friendship during his own presidency, but it was after that they truly got to know each other, when President George W. Bush asked his father and Clinton to be involved in U.S. relief efforts for the 2004 Indian Ocean tsunami disaster and Hurricane Karina in 2005. They traveled together far and wide in their efforts. "His friendship has been one of the great gifts of my life," Clinton said. "I cherished every opportunity I had to learn and laugh with him." They were 22 years apart -- Clinton, 72, Bush, 94. In June, Clinton visited Bush in Kennebunkport, Maine, and a photo posted on Twitter shows the 41st and 42nd presidents together as Bush displays a pair of "Bill Clinton socks" from his colorful sock collection. Affection between presidents, across today's toxic political divide, has extended beyond Clinton and the elder Bush. The Clintons and the Obamas both became friendly with the Bush family and attended Barbara Bush's funeral in April. Trump did not, though first lady Melania Trump did. Trump had mocked two generations of the Bush family in his political rise, criticizing father and son presidents while defeating the other son, "low energy" Jeb Bush, for the Republican nomination. The elder Bush called Trump a "blowhard" and voted for Hillary Clinton in 2016. Without naming names, Bill Clinton closed his remembrance in the Post with an observation about the way things are now. 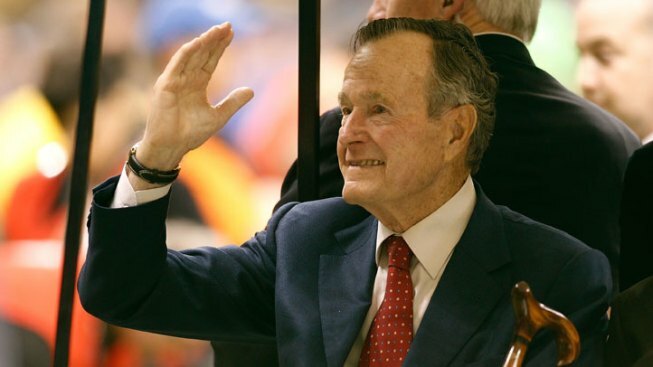 "We should all give thanks for George H.W. Bush's long, good life and honor it by searching, as he always did, for the most American way forward."